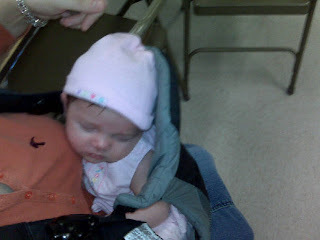 Emma-Kay hanging out on Mama's chest at Lilly-Rose's school. 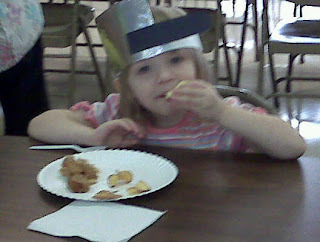 Lilly-Rose on Johnny Appleseed day at her school. I went to help the class out. They taste tested everything apple. 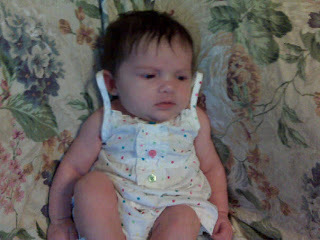 Emma-Kay...I got this dress on clearance at Walmart for 1.00! Grocery shopping outing. I still do not understand how newborns can lose their socks. They don't even walk yet..lol. 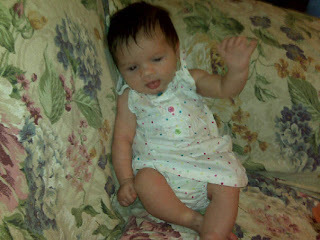 Hanging out at Papa and Memaw's house. 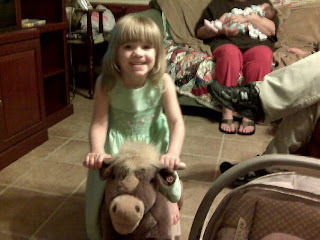 Doots loves this little horse they have. 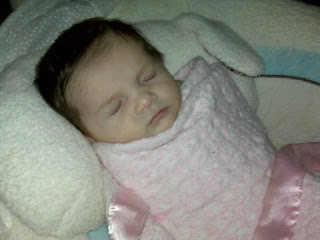 We have found that Emma-Kay is definitely a papoose baby. 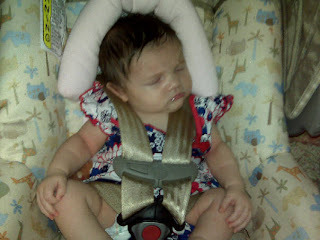 It really helps put pressure on her tummy during the time that she is very colicky as well. I always think this picture is funny. It's like she is saying..."Man, you can't get any sleep in this house!" Doots loves the Smurfs. I forgot I bought this party set at a yard sale some time back. 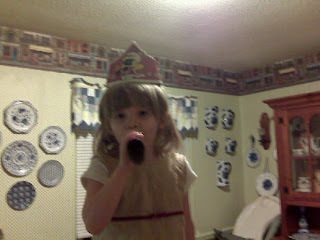 So I gave her the set and she had her own little party. 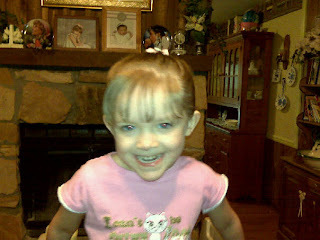 We had just gotten home and Lilly-Rose was being sort of loud on this day. 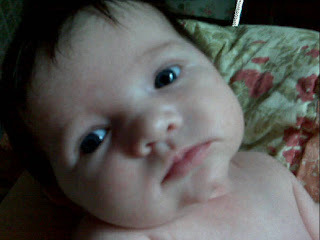 Emma-Kay looks like she is getting mad that her big Sissy woke her up from her beauty sleep. 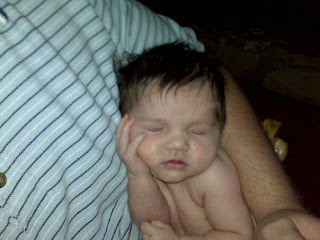 We call this her baby model pose..lol. Doots was sick today. So I snapped this picture to show how pitiful she looked and her best friend that would not leave her side. I love the spiked hair do. 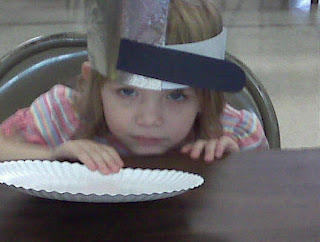 Yeah, she wasn't too thrilled. This was her first time. Sisterly love. 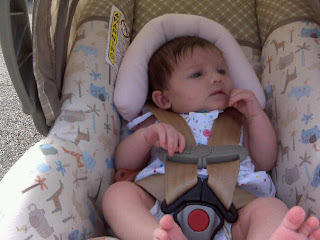 Emma-Kay is a beautiful little baby...and Lill-Rose is a beautiful little girl. dress for $1?! That's as good as goodwill prices! Good question, just how do newborns lose socks? Unless they have older sibling's help. Spiked up hair...too cute. Josiah's does that, but his is because it seems that, for now at least, it is very curly.